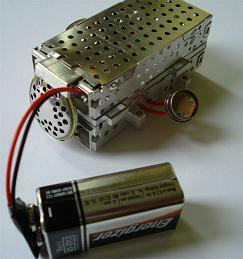 Popular Science shares an article with instructions and schematics for building a small optical theremin for under $20. This would probably be a great project for someone fairly new to electronics. Being an optical theremin, it doesn't operate on the same principles as true theremins, but the end effect is similar. The author notes that this particular design is very light sensitive and recommends playing it under "subdued lighting" for best performance. If you're not into parts gathering, you can also try building one of these optical theremins on eBay for a similar project. Now, I'm not too fond of cheapy optical theremins myself, but I suppose they do have their place. Years ago, when I was probably 8 or so, I wired up a small optical theremin by following instructions in one of those old spring-connection type 150-in-1 electronics kits from Radio Shack (here's the actual kit). Thinking back to my childhood, playing with that kit was probably one of the main reasons I got interested in electronics, electronic music, making LEDs light up, and eventually computers. So maybe this little project will inspire some new young person to follow the pursuit of gadgetry.